The latest page of the League of Legends community comic collab “Olaf vs. Everything” is here, and Olaf may have just made a new friend. Up until this point, Olaf has been tossed around from skin universe to skin universe, finally falling into the world of the Battlecast creations. The Berserker first encountered Chemtech Tryndamere, Viktor’s latest test subject. The two skirmished momentarily before Tryndamere fled the fight with the axe-wielding hero in tow. 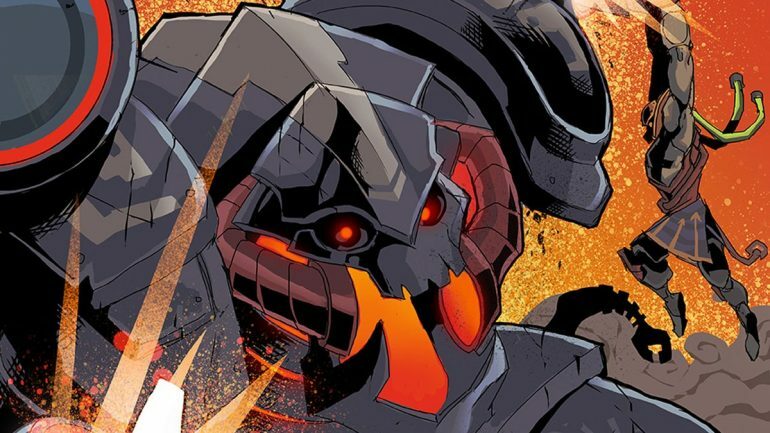 Last week’s page left readers with a glimpse of Viktor and his Battlecast creations poised, ready to attack Olaf as he chased Chemtech Tryndamere. Viktor commands his crew to recapture Tryndamere and rid the scene of any witnesses. In today’s page, Olaf’s chase is interrupted by an attack from the Battlecast foes, including Vel’Koz, Kog’Maw, Cho’Gath and Urgot. When Olaf and Tryndamere retaliate, Vel’Koz asks the test subject if he’s friends with Olaf, but Tryndamere denies any connection. The page then ends with the two characters, although outnumbered, fighting back-to-back against Viktor’s creations. New pages release every Monday, so readers can check back next week to find out what happens next.